With nearly a quart of leftover buttermilk in the fridge, we got thinking. You can make ice cream out of cream, milk, ricotta, and yogurt, so why not buttermilk? 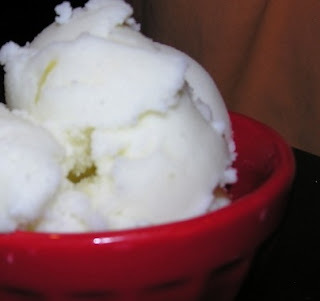 Some cursory internet searching made it obvious that this was not an original idea, and we quickly came upon a David Lebovitz (the reigning ice cream king) recipe for lemon buttermilk sherbet. A frozen dessert made primarily of fruit juice, sugar, and water, and also containing milk, egg white, or gelatin. It couldn't be easier to prepare – the only ingredients are water, sugar, lemon juice, lemon zest, and buttermilk – and boasts a tart and grown-up taste. Directly out of the ice cream maker, the sherbet was delicious and refreshing, even if the texture left something to be desired after a few days in the freezer. I guess we've learned a few things about sherbet. Powdered buttermilk (reconstituted) is a virtually indistinguishable alternative to carton buttermilk and doesn't leave you with an unused pint in the fridge which you often have to throw out eventually. Thanks for the tip - although I rather enjoy the challenge of using up old odds and ends that are left in the fridge or pantry. We made some yummy Irish soda bread with buttermilk, although my favorite buttermilk-using recipe is for pumpkin-buttermilk pancakes.